Due to the abundance of restaurants around the metro and the increase in food-related publications, the demand for food photography is on the rise. 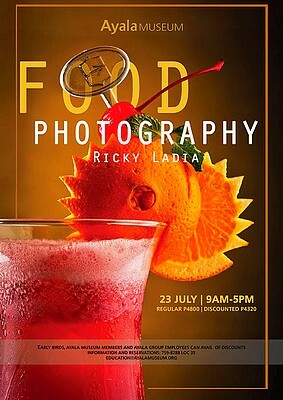 Sign up for Food Photography Workshop with Ricky Ladia, happening on July 23, 9 a.m., at the Ayala Museum. In this workshop, aspiring photographers will be taught to make any cuisine look more appetizing. To challenge participants in working with variable light conditions and the dynamic outdoor environment, the photoshoot will be conducted in the restaurant settings of Museum Cafe and Kabila near Greenbelt Gardens. The workshop fee is P4,800. For inquiries and reservations, call 759-8288 local 25 or e-mail education@ayalamuseum.org.